Scientific Name(s): Atropa belladonna L.
Well, it’s the weekend, so I hope you don’t mind if I reiterate my request for your contributions to the Flower Mandalas Project from a few days ago, now that you might have some contemplative time. I notice Tim Bray has made mention of it and that’s helped generate a number of comments for David’s project, but there is certainly room for many more! On to today’s photographs. The two images were shot within seconds of each other. All in-camera settings were the same for the photographs, and both were processed digitally with the exact same settings. So what accounts for the difference? Last week, in the photography resource link for this entry, I highlighted an article about the importance of polarizing filters. 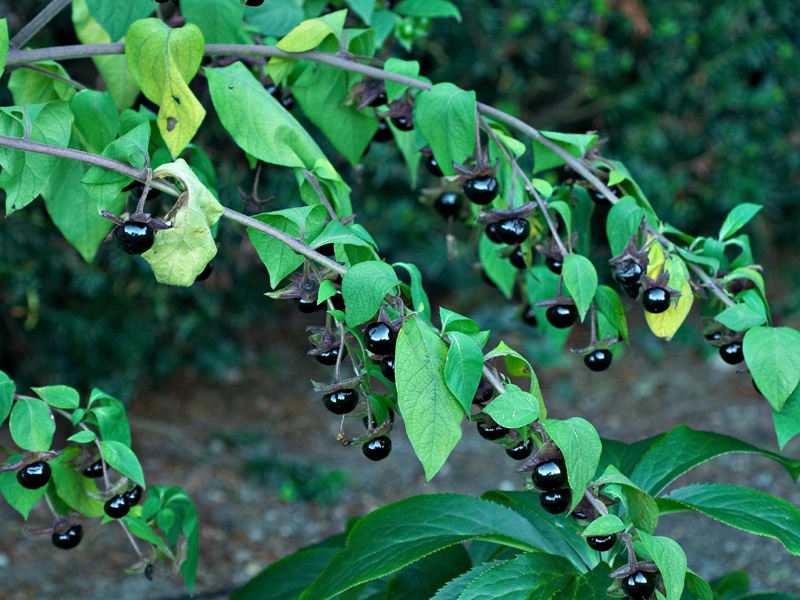 These photographs of deadly nightshade are my little contribution to illustrating why. The polarizer is at maximum effect in the first photo, then twisted a quarter turn (so essentially removed altogether) in the second photo. Note both the boost in the warmth of the photo and the reduction in glare or reflections on the glossy fruit. Atropa belladonna is a member of the Solanaceae, the tomato or nightshade family. Like most members of the family, its various parts are poisonous, though perhaps more violently so in deadly nightshade than other members. Despite a reputation for causing death, somehow, inexplicably, someone managed to discover that the application of juice from the fruit to the pupils of the eyes will dilate them. Apparently, large pupils are seemingly attractive, as this was a technique employed both by Cleopatra and women of the Renaiisance era. You can read more on Wikipedia about atropine, the responsible alkaloid. On a different topic, I’d like to draw your attention to the first-ever Circus of the Spineless! Circus of the Spineless is a monthly gathering of recent online essays and photographs about invertebrates, from insects to squids to spiders. I submitted the BPotD entry on Antheraea polymorpha, but that’s only one of fifty or so contributions to the compilation. There is a lot of top-notch writing and photography, and if you are at all interested in the little (and not-so-little) spineless critters that share this small world with us, it’s well-worth the visit. Photography resource link: Something I’d like to try one day is Kite Aerial Photography. Charles Benton’s site has many galleries of his work — some of them even have a botanical bent. Thanks for posting both versions. Each has a strong point, the first displaying a wider range of color while the second shows the reflections from the berries better. My opinion is that the shiny reflections are the aesthetic key to this shot. Thanks again for an endlessly involving website. Anthony – interesting, as I prefer the former. What has particularly been illustrated to me as I share these photos is how subjective it is. What one person likes, another person says boring, and vice versa. Do you think this was the plant used as a real drug to american soldiers during the vietnam war? I got this from the movie Jacob’s Ladder by Adrian Lynne which tells a story of how the drug BZ was used on soldiers which was extracted from the belladonna plant. Gregory, I don’t know about whether it was used or not, but it certainly has the potential: Nerve and Incapacitating Agents. Before atropine gets a bad name it is one of the most commonly used ER drugs worldwide as well as in ophthalmology and anaesthesia. Which doesnt mean that it is not a lethal poison, it is, but used properly in the right doses is a lifesaver. It would be idiotic to use in healthy soldiers. I prefer the woman with the same name. i have this stuff in my back yard and didnt know what it was. My dog ate some last year and got really sick not even the vet could identify the herb . I have read about the plant and find the claims very of being poisonous considering that my family/neighboord eats it, the leaves only. Please be careful this plant is poisonous by eating and also by contact with the skin, it can lead to death especially small children. The drug given to Viet soldiers was most likely anphetamin.